The world’s leading climate experts and Nobel Prize winners predicted the Arctic would be ice-free sometime between 2013 and 2018. Ms Griff: Don’t tell me another alarmist Arctic prediction failed. 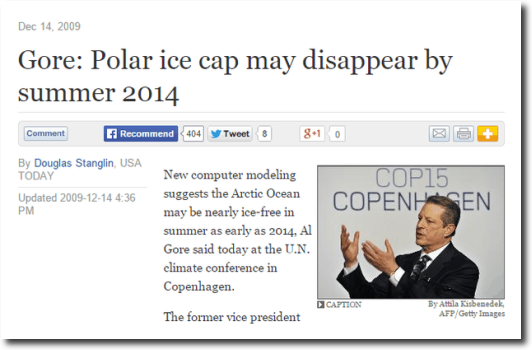 Tony: Another alarmist Arctic prediction failed. Ms Griff: I asked you not to tell me that! Griff clued me on the new Ice Free Arctic Date: 2030 to 2050. I’m using 2040. Something to look forward to. I’d say it’ll be real bad in 2080, 2100 for sure. Gore looks like a total imbecile staring at his hands like that. If it looks like an imbecile and makes makes imbecilic predictions, it is definitely and imbecile. To think he came so close to being President makes my blood curdle. Of course, the other imbecile that won was not a whole lot better. Apparently, the smarter people have chosen not to run for public office. We’re toast … but not from global warming. mad scientist and realised it is easier to fool them than a bunch of little children – and it is much better paid. He’s simply looking at the blood on his hands, as he should. Ms Griff: “What about Alaska, what about Alaska, there’s climate change there! Griff doesn’t care about reality. Nor does Phil. It’s all about protection of belief. CO2 doesn’t do what was predicted by the hyped-pothesis. Disillusionment is hard. However, disillusionment is good. Disillusionment brings freedom. I am getting more pissed off by the day. 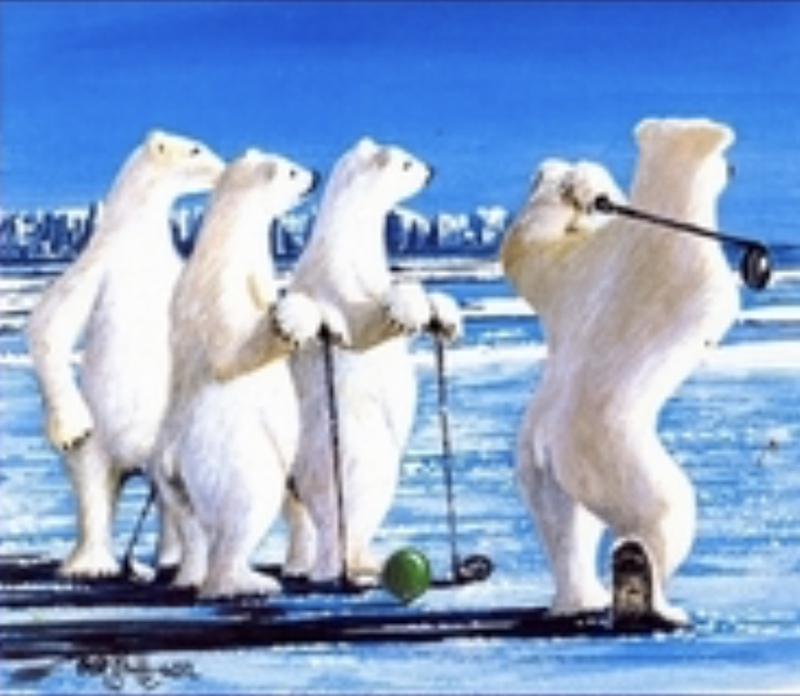 They promised me new Arctic golf courses .. and I see none! … They promised !!! Sorry Squidly, but it bears repeating that those courses are dominated and restricted to old white guys. They are bruining it for everyone. Sure. Your foursome has a tee time in Greenland tomorrow morning 8:05. Go with the floe! Wear your woolies. 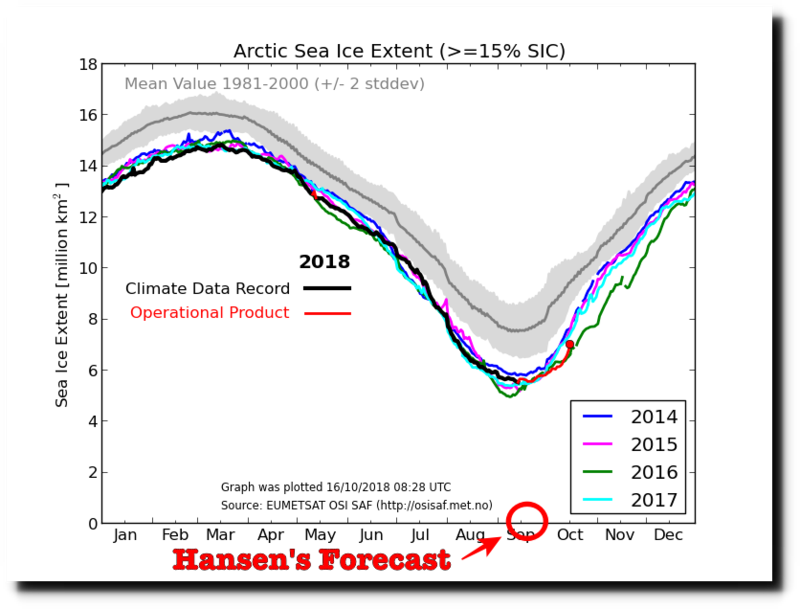 I love how you’re acting like you’ve “owned” the alarmists by saying the arctic isn’t ice-free yet, even though the sea ice extent in 2018 is still far below average. Which average Sir Mister? The cherrypicked and meaningless average starting in1979? Or the more realistic and meaningful average of the past 9000 years? The “average” I’m referring to is the 1981-2000 average in the graph shown in this post. So the meaningless cherrypicked alarmist “average”. Why do you suppose that grantologists and climanumerologists choose such an insignificant average? We are about to see just how honest/intelligent Sir Mister is! FACT IS, the current extent is well within THE TOP 10% of the last 10,000 years.. It is ANOMALOUSLY HIGH. Try not to be a CLIMATE HISTORY DENIER all your feeble-minded existence. And finally compare to the predictions of your Wadhams, Gores and Sereezes. In fairness, your point is well-taken: the “average” is the line inside the gray 2 standard deviation region, and recent ice levels are indeed well below that. If ice variation were truly random, then being outside the 2 standard deviation gray band would be something that random fluctuation could explain only 5% of the time, so the observed deviation is very significant. And so it has been, for several years running. This having been said, to claim this is a trend caused by CO2, you have to know what the variation would be without CO2, over the last 200 years at least, to see what solar orbital variation might cause, and over hundreds of thousands of years, to observe effects due to cosmic ray variation moving in and out of galactic arms. Do we have such ice volume data during the “new ice age” scare of the 1970’s, or the little ice age of the 1870’s? I think it’s really premature at this point to believe at a policy level that dropping CO2 levels is going to make a difference, and even whether cooling the earth would be a good thing. THAT debate is the one we should be having. Best-effort models shouldn’t be believed until they can explain non-anthropogenic climate variation, specifically the Roman and Medieval warmings, and the Maunder and Dalton mimima over the last 2 millenia. Get back when you’ve done that. This is a rational response. I don’t expect Mr Sir to be back anytime soon.